When Sony released the PlayStation console the company had no prior experience with consumer gaming—having never previously developed a game, let alone a console system—but the PlayStation ended up a megahit that introduced 3D gaming to a mass audience and kick-started the video game CD-ROM revolution. Yet had it not been for a contract dispute, the “Play Station” would have been released by Nintendo as an add-on to their Super Nintendo console. During the first and second generations of video game consoles, many electronics companies jumped on the console bandwagon. After all, they already built products using the same parts, so why not enter into the hot new gaming fad? Magnavox released the first video game console with the Magnavox Odyssey, which inspired Pong, then RCA released the RCA Studio II (a Pong clone), and even the Fairchild Semiconductor company made the Fairchild Channel F. Sony, which was founded in 1946, didn’t release its own video game system until the mid-90s, but it wasn’t for lack of trying. After the crash of the video game market in 1983, Nintendo rebuilt the industry with the Nintendo Entertainment System, quickly making them into the dominating force of the video game industry. When developing the Super Nintendo Entertainment System, their second cartridge-based console, they signed a deal with Sony to supply the systems audio processor—the Sony SPC700. As Nintendo continued developing add-ons for the SNES, including a short-lived modem released only in Japan, Sony focused on its core business of technology and in 1986 developed alongside Philips Electronics a new kind of CD-ROM called the CD-ROM/XA. The new type of disc allowed compressed audio, video, graphics and data to run simultaneously. The original CD-ROM could contain audio, graphical or data information, but could only run them independently. By combining these three elements together games could use larger, more advanced graphics and audio that could be accessed by the data files all off a single disk. On the news of this hot new technology and leveraging their existing relationship, Nintendo approached Sony to start development on a CD-ROM add-on to the Super Nintendo, with plans on making it Nintendo's first disc-based console. The deal was made in 1988 with Sony crafting the tech and Nintendo releasing the Play Station expansion. Plans derailed because of a contract dispute that prompted Nintendo to reconsider the relationship. Nintendo quietly made a side-deal with Philips Electronics to make a different disc-based SNES add-on and canceled its existing agreement with Sony. While this was a setback for the electronics giant, they decided to continue developing the technology to create their own console. While the deal that Nintendo made with Philips fell apart, it didn’t mean Sony had heard the end of the gaming giant. Once Nintendo got word that Sony was using the tech they developed under the partnership, Nintendo tried to cease the development of the system by suing Sony. The case was found in favor of Sony, which was allowed to continue development of the system. Until the release of the PlayStation, console games were primarily cartridge-based and those cartridges were quite expensive to make, with long manufacturing cycles. Also, 3D and full-motion video games required large files and technology that to put them in a cartridge would have cost so much it would have been impossible to make a profit. Sony had spent years developing their console system but was late in creating an internal game-development division. While they did put one together in November 1993—Sony Computer Entertainment—the system was slated to release in Japan the following year, which wasn't enough time to give their upcoming console a full slate of launch titles. Sony, however, received significant support from other game publishers. Computer gaming had already jumped on the CD-ROM bandwagon, so game publishers and developers already knew the benefits. CD-ROMs held more storage than floppy disks or cartridges, plus could interlace audio, data and graphical files simultaneously, so they could meet the powerful needs necessary for a 3D-rendered game or full-motion video. Also, they cost a fraction of the price of any other medium and could be manufactured quickly and at volume. Sony had lofty plans to create one of the first consumer 3D disc-based console systems, but there was one slight problem. Unlike Nintendo, SEGA and even Atari, they didn’t have an in-house game development studio. Typically the manufacturer of the game console releases some of the best games for their respective systems. Primarily because consoles cost so much to manufacture, without the revenue of games they wouldn’t make a meaningful profit. The benefits of a major disc-based console system as powerful as the PlayStation's capabilities had third-party publishers and developers chomping at the bit to develop for it. The partnerships allowed developers to start early and allow the system to launch with a robust selection of games, with a constant stream releasing every week. Finally, in 1994, Sony released the PlayStation (aka PSOne) in Japan and 11 months later launched the console in North America and Europe (S1995). The system was an instant hit, quickly eclipsing the Super Nintendo as well as Sega’s own disc system, the Sega Saturn. A year after the PlayStation’s release Nintendo released their own 3D gaming console, the Nintendo 64, but Nintendo stuck with the cartridge format, which inevitably led to its downfall for the very reasons developers were drawn to the PlayStation. Without third-party support, the N64 had a smaller library, and while some of those titles are considered the best games of the time, including Goldeneye 007, there simply wasn't enough of them to keep up with the PlayStation. When the NES released in 1985 the term video game had a bad connotation after the market flood of poor quality games that lead to the industry crash, so Nintendo decided to refer to it as an entertainment system and design it as a home entertainment component, instead of touting it as a video-game system. Sony took a page from the same book and referred to the PlayStation as a computer entertainment system instead of a console. The PlayStation could not only play the system’s official game discs but also music CDs and later (with an adapter) video CDs, which were the predecessors to DVDs. This made it not only the most powerful but also the most versatile system of its time. Even after Sony released the PlayStation 2 in 2000, the company continued to support the original PlayStation, encouraging developers to continue publishing and developing for the system for six years into the PS2’s lifespan. In 2006 Sony ceased manufacturing the original PlayStation, giving the system a 12-year lifetime and ending it as the first console to sell 100 million units. 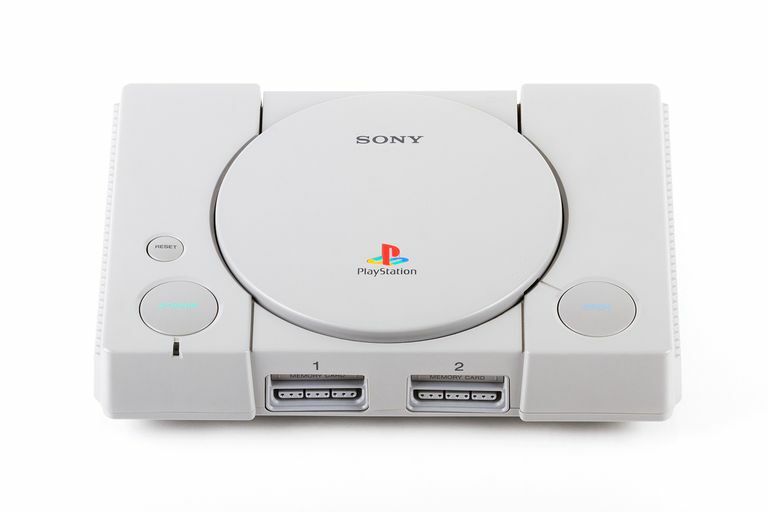 Today the term PSOne—or PlayStation One—has expanded and is now used not only for the revamped model but the original PlayStation console as well. While games have visually advanced and the controls better defined, the PSOne introduced gamers to the 3D world of games and kickstarted the CD-ROM revolution in the world of gaming.